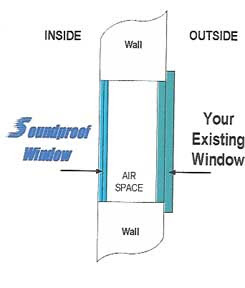 A soundproof window is a second laminated window (two sheets of glass with clear plastic membrane sandwiched between) installed behind your existing window, with a dead airspace between. The second window should mimic your existing windows. So, if your seeking fresh air you will have to open two sets of windows to get to that fresh air. This type of setup is very effective at shutting the noise out and you can expect 80% or more reduction in noise. When purchasing these types of windows, it is best to take a look at more than one manufacturer. You may prefer one design over another. Also, consider that there is only a slight difference in sound reduction with the different thicknesses of glass 1//4", 1/2", and 3/4". They will try to push the thicker sizes because they are more expensive. Some, may argue over this point, but it is really the dead air space between the windows that helps reduce the sound, and 3" inches is supposed to be the ideal distance between windows. The price for a 3' X 5' window will range from $500 to $1400. If your on a budget you can just install another like window behind the existing one. That is if you have the space. The optimal air space gap between the windows should be 3 inches. Of course as always there is some disagreement over the what size the gap should be. Installation of these windows is very important, they should be airtight, no gaps. Double pane windows are not as effective at reducing noise they may reduce the noise up to 20% and vinyl frames 30% to 50%. See and hear for yourself how effective double windows are. The videos on this page are very interesting. None of the websites for "maxmylife.com", or "Miraculous Window Treatments" seem to actually exist, though. Are they out of business? I'm looking for something in the Chicago area. Thanks for all the info on blog, its great stuff. I have found two manufacturers that will ship windows to Chicago (also live in Chicago, different post from comment above). Soundproofwindows.com who use alluminium frame and 1/4 laminated glass. Also, soundguardwindows.com who use vinyl frame but a two glass system spacer system (with one pane being laminated) or something of the sort totaling 3+inches in width. They are both close in price (soundguard little more expensive). Both claim that their frames are better for sound and I cant find definative answer. Alluminium more dense, vinyl doesnt vibrate, etc. Can you give your un-weighted opinion on which frame and/or window system would work best (maybe check out both websites and let usknow thoughts)? (I will have a 4-6 inch air gap between existing windows, so hopeing for solid results when I do pull the trigger and order one, just dont know which one is better system). PVC (vinyl) window frames are better insulators than aluminum frames, although the difference between the two is somewhat reduced when the aluminum windows have thermal breaks. This means that vinyl windows will be more energy efficient and less likely to have condensation form of the window frame. They are also supposed to be maintenance free. The aluminum soundproof window frames have more mass, therefore, they should block more of the noise. The vinyl soundproof windows probably have thicker frames then your normal vinyl windows to make up for the lack of mass. However, because of the thicker frames, this may reduce the airspace between the windows. Some people may argue that the reduction in airspace may reduce the sound blocking capabilities of the windows. You should ask to the Transmission Loss Reports for the windows to see which window is best at blocking sound. If they are similar then you should just way the pros and cons of vinyl vs aluminum. This is really amazing treatment for soundproofing. I went with an interior soundproof window from CitiQuiet here in New York. They work flawlessly and I can't hear any noise at all from the West Side Highway. Would definitely recommend anyone in my predicament take a look at www.citiquiet.com for further details. It's definitely a great idea to use soundproof windows especially if you don't like what you hear outside your house. how heavy are these windows.? i read somewhere they are very heavy.? I am thinking of using soundproofwindows. Are their windows really easy to install.? Are you any companies providing solution in Toronto.? I found bquiet but they seem to be providing the same solution as soundproofwindows with more than double the price.? This is perfect for houses or offices near road to avoid hearing those noisy vehicles.